Although great strides have been made through 50 years of ecumenical dialogue, Catholics and Lutherans must continue to work toward becoming a full and visible sign of unity for the world, Pope Francis said. 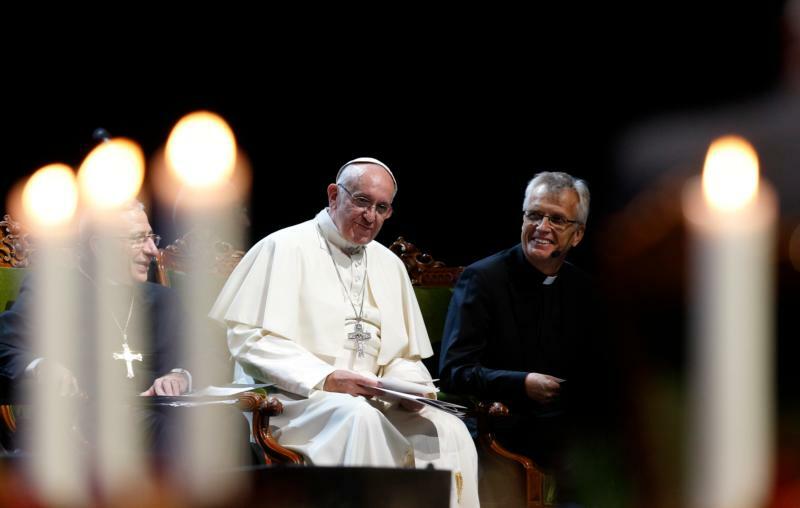 A continued "communion of harmony" will allow Catholics and Lutherans to "find further convergence on points of doctrine and the moral teaching of the church," the pope told members of a pilgrimage from the Evangelical Lutheran Church of Finland on Jan. 19. "I pray to the Lord that he may bestow his blessing on the Lutheran-Catholic Dialogue Commission in Finland, which is working diligently toward a common sacramental understanding of the church, the Eucharist and ecclesial ministry," he said. The pope met the Finnish delegation during the annual Week of Prayer for Christian Unity. The theme chosen for the 2017 observance was: "Reconciliation: The love of Christ compels us." The week of prayer, Pope Francis said, urges Catholics and Lutherans to reconcile and "draw closer to one another anew through conversion." "True ecumenism is based on a shared conversion to Jesus Christ as our Lord and redeemer. If we draw close to him, we draw close also to one another," the pope said. Recalling his visit to Sweden last October to commemorate the 500th anniversary of Martin Luther's efforts to reform the church, the pope said Luther's intention "was to renew the church, not divide her" and that the joint commemoration "was important on both the human and theological-spiritual levels." "The gathering there gave us the courage and strength in our Lord Jesus Christ to look ahead to the ecumenical journey that we are called to walk together," he said. Helping those who suffer persecution and violence, he added, can further unite Christians "on the journey toward full communion." In doing so, the pope said, Catholics and Lutherans can put their witness of faith into practice "through concrete acts of service, fraternity and sharing." Speaking off-the-cuff, Pope Francis thanked Lutheran Archbishop Kari Makinen of Turku for bringing his grandchildren to the meeting. "We need the simplicity of children; they teach us the way to Jesus Christ," the pope said. The difference between Catholics and Lutherans -- they sing, we don't.